Successfully Added Professional Grade RF Audio Bug with Wireless Transmission to your Shopping Cart. With this Audio Bugging Device plus wireless receiver, you can secretly listen to conversations in a room from up to 150 meters away. Join the professionals in the world of games, surveillance and investigation with the ultimate RF audio bug! 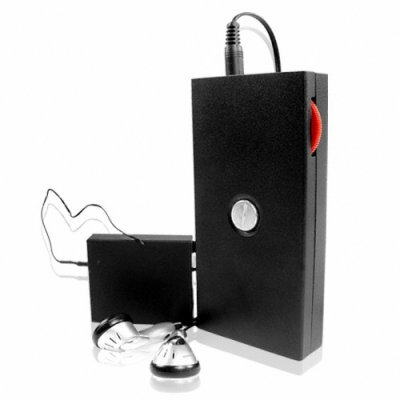 The small transmitter with built in microphone has a slim profile enabling it to be easily hidden and contains an internal rechargeable battery for total wireless operation. The transmitter and receiver can be easily charged by USB for added convenience. Plus, the receiver has an earphone out and and extra 3.5mm out for recording to digital audio recorder, cassette tape, or portable DVR. Another vital piece of technology for your tool kit and a very profitable item for drop shippers, so get yours today. Only from Chinavasion, home to all of our low profile surveillance items. Pictured DVR is for demonstration purposes and can be purchased separately. Chinavasion does not encourage or condone unauthorized surveillance or privacy invasion of any kind. It is your responsibility to ensure such products are permissible to import into your destination country. on 2009-05-16 04:17:34 Excellent product! It is just amazing! i love it! works perfectly! also i love that it is rechargeable batteries! thank you!